On extra-busy days, it helps to see all of your shifts and appointments at once. 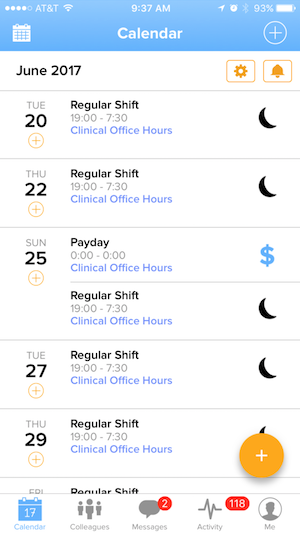 NurseGrid's list view now shows you all of your shifts in a traditional agenda format! At a glance, you'll be able to see all of a day's events, along with their start and end times. Icons on the right side of the screen will let you know quickly what kind of event is scheduled. To switch to list view, just tap the list icon in the top-left corner of your Calendar tab. You can always toggle back to the alternate view by tapping the calendar icon, too. Note: NurseGrid's list view will only show you future events; to see events that have already occurred, please use the original calendar view.